The calligraphy above has been drawn by an algorithm simulating the writing, brush, ink and paper properties. The writing has been self taught by the algorithm using machine learning (genetic algorithm), from real calligraphies made by a Japanese calligraphy master. A given level of freedom in writing generates unique calligraphies at each iteration of the algorithm (3 differents one are randomly displayed here for each set of parameters). Properties being configurable at will, various designs can be achieved and controlled. Please try by yourself by selecting your own parameters at the top of this page. Also, training on other sets of characters allows the algorithm to master various styles, as well as occidental or arabic calligraphy. Currently the algorithm has only learnt to write the japanese hiragana list and this page is a simple illustration of its potential. A video showing one calligraphy under drawing by the algorithm is available here. 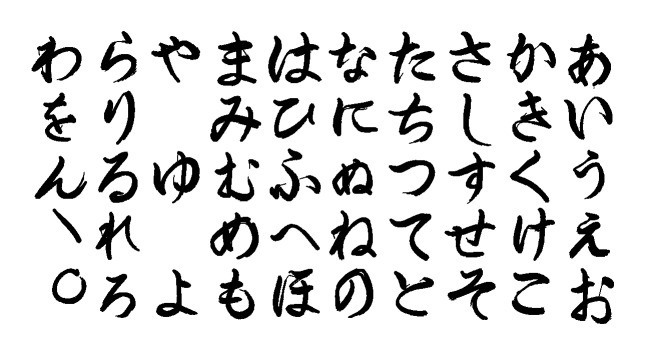 A video showing one kanji under learning by the algorithm is available here Following development will allow to draw katakana, kanji and freely formated text. Comments are welcome at Pascal (at) BayashiInJapan.net.